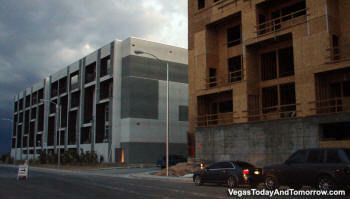 Loft 5 is located near Las Vegas Blvd, south of McCarran Airport and near the new South Point resort. 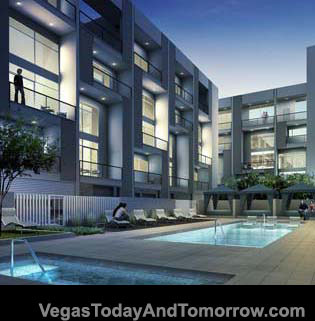 The minimalist design, the six-story LOFT 5 combines the evolution of modern architecture with the latest amenities. 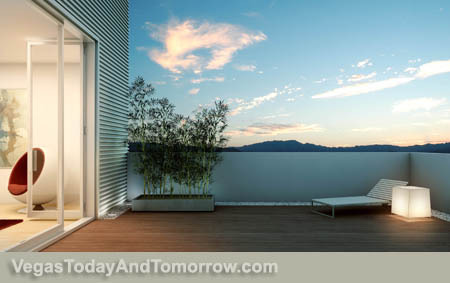 Residences range from studios to penthouse lofts with private sky-decks to multilevel lofts with 20’ ceilings and private terraces. In the unique courtyards, relaxing pools can be found amid peaceful gardens along with recreation pools, hot tubs and fire pits. Lifestyle centers with fitness spa, a club lounge and theater screening rooms are complemented by a professional concierge. Floor plans are from 600 square-feet to over 2,000 square-feet, and include studios and one- and two-bedroom units. Construction photo 7/29/06 Taking shape.